After making my cilantro tabbouleh, I had enough quiona to make another dish. While rummaging through the fridge, I found some mini peppers and decided to create a spanish style quinoa bowl. I did make a mental note to make my smoked almonds next time rather than using just raw almonds. The smoky flavor of my roasted almonds would be perfect for this! Place oil, lemon juice, Worcestershire sauce, and garlic into a mixing bowl. Whisk. 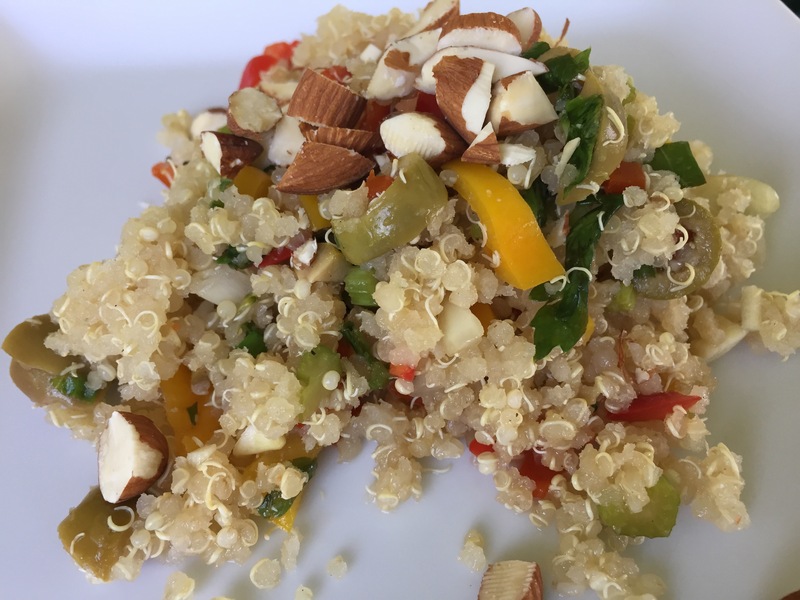 Add in quinoa and remaining ingredients except almonds. Stir, cover with plastic wrap and chill for at least 30 min. Serve with almonds scattered on top.